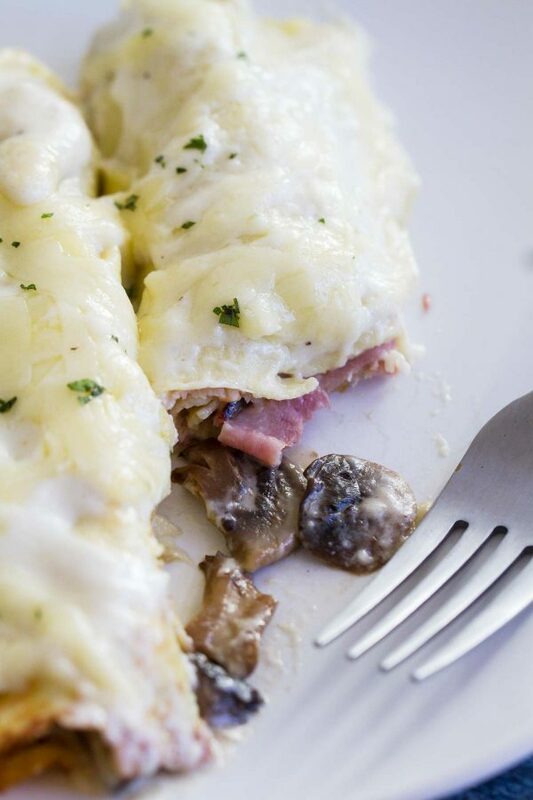 A great way to change up dinner, these Savory Crepes with Ham and Mushrooms have crepes that are filled with ham and mushrooms and are topped with a delicious cream sauce. Crepes are one of those things that always sound super fancy, but they are actually quite simple. I remember when I visited Paris and getting a crepe from a stand on the street. They made it using one of those big hot plates, and spread it super thin. It has been many, many years since I was there, but I still think about and crave those street crepes. It’s a good thing that I can make crepes at home, though! And especially that I can even make them for dinner. Dinner Crepes – Not Just For Breakfast or Dessert! For the longest time, I thought crepes were just for breakfast or dessert. I had only ever seen crepes filled with sweet fillings. 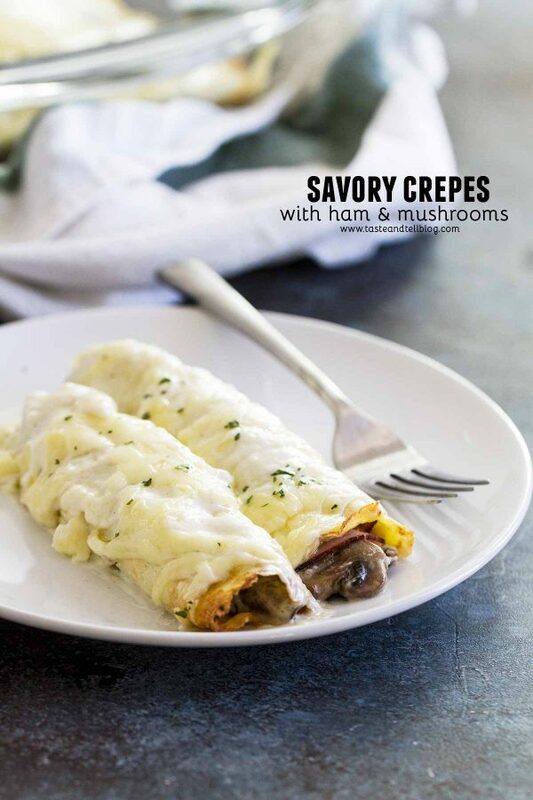 But the first time I tried making savory crepes for dinner, I was sold! 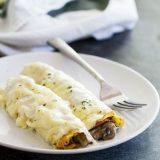 This savory crepe recipe has you using the crepes like you would tortillas in enchiladas – you fill them, then roll them, then cover them all with a delicious sauce. 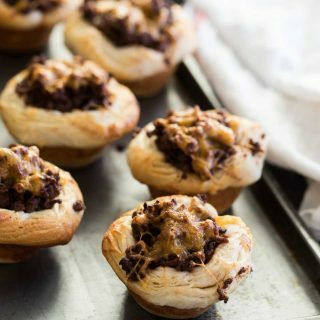 These are a great way to change up dinner! What Is a Good Savory Crepe Filling? 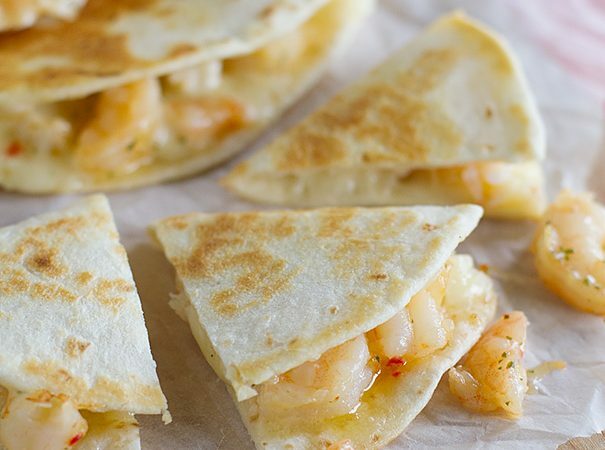 These savory crepes are made much the same as a sweet crepe. I do not add any sugar to this crepe batter recipe, though. Crepes are actually quite simple to make. I combine all of the ingredients in a blender and pulse a few times to combine. 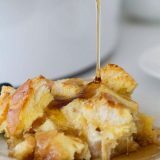 The important step is to let the batter sit for about 30 minutes to allow the gluten relax and for the flour to absorb the liquid.Your crepes will be much more tender if you let the batter rest. You can even make the batter ahead of time and store it in the refrigerator. I like to mix the crepe batter in a blender to insure that everything is mixed evenly. 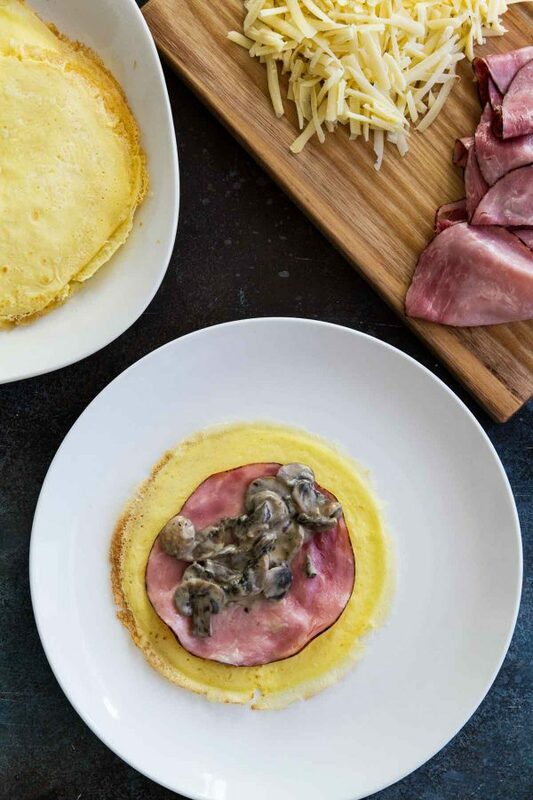 You don’t need a fancy crepe pan to make these crepes – although you could use one if you’d like – but I just use a 6-inch nonstick skillet. Place the eggs, milk, flour and salt in a blender and pulse a few times to combine. Set aside for at least 5 minutes. Alternately, if you don’t have a blender, you can whisk the ingredients together. In a 6” to 7” nonstick skillet, heat a small amount of butter – just enough to coat the bottom of the skillet. Add about 2 tablespoons of the batter and tip the pan around to evenly cover the bottom of the pan with the batter It will be very thin. Let it cook until it is lightly browned on the edges, then flip over to cook the second side. You may need a rubber spatula to loosen the edges. Once the second side has lightly browned, remove from the skillet. Repeat with the remaining batter, making 12 crepes. In a 12-inch skillet, melt 3 tablespoons of the butter. Add the mushrooms and cook until browned. 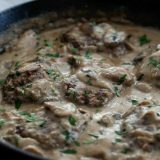 Sprinkle 1 tablespoon of the flour over the mushrooms and stir to coat. Cook for 1 minute, then add in 1/2 cup of the cream. Cook until thickened. In a saucepan, melt the remaining 1 tablespoon fo butter. Stir in the remaining 1 tablespoon fo flour and cook for a minute or two. Whisk in the remaining 1/2 cup cream and 1/2 cup milk. Grate in a small amount of nutmeg. Cook until thickened. Spray a 9×13-inch baking dish with cooking spray. 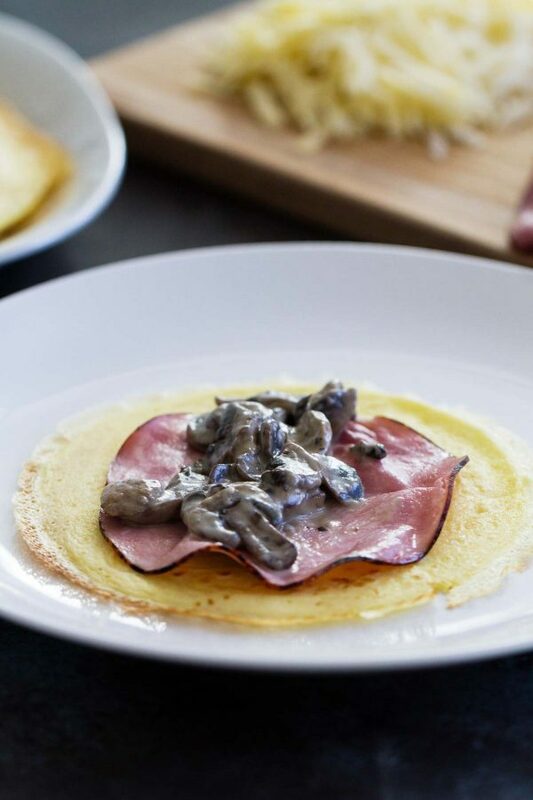 Put a piece of ham on each crepe, then top with some of the mushroom mixture. Roll each crepe, and place seam side down in the prepared baking dish. Top with the sauce and sprinkle the cheese over the top. 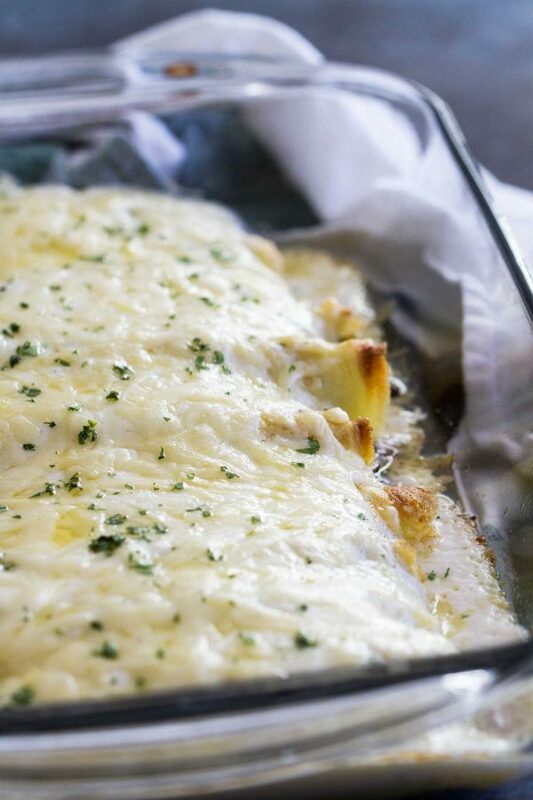 Cook in the preheated oven until heated through and the cheese is melted, about 10 minutes. Cooking and baking for other people inspires me! I love coming up with dishes that friends and family will love 🙂 Food is always a great way to bring people together. Those crepes brought me to tears. I’m SERIOUS. So beautiful. What inspires me in the kitchen is all the color from my cookbooks and tea clothes! And maybe the buzz from wine when cooking. SHHHH. There are so many things that inspire me in the kitchen. In fact, I sometimes find myself consumed with all things food! I get a lot of inspiration from food blogs and magazines though. What inspires me is cooking for my family. I LOVE doing it! I love reading food blogs and magazines for inspiration, it gives me so many good ideas! This is such a classic combination. Love this idea! Making tasty meals for me and my family to enjoy at the end of they day! I read a lot of food blogs and cookbooks. they greatly inspire my cooking. I am inspired in the kitchen by trying new things, techniques, ingredients and improving my skills. inspiration in the kitchen comes from within. it’s calming for me to cook or bake and create new ideas. i think of what i’m in the mood for and combine that with what i have and the ideas sometimes just flow. my cooking comes from the heart and i love the feeling when someone tries something i’ve made and it’s a big yum for them. I love cooking for friends and family, and that inspires me to search for new and exciting recipes. The wonderful fresh produce this time of year inspires me to see how many different ways I can utilize it with as little cooking as possible, so as not to heat up my kitchen! Thank you for the giveaway; I love the cutting board! My husband could eat pork for every meal! 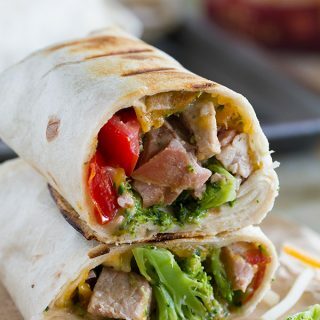 I am always trying new pork recipes! Those crepes look so good! My children inspire me in the kitchen. I love to make something that I think they will love. Also, my latest food cravings inspire me to try that ingredient in lots of different ways. My inspiration comes from reading food blogs and watching cooking shows. Also finding good ingredients. Fresh. Or unsual ingredients are what inspires me to cook. my mom and grandma have inspired me greatly in the kitchen! What inspires me? Wow. That’s tough, so many things do. My mother’s cooking of course, love her Southern influences. And blogs blogs and more blogs are what influence me. I see the amazing creations that others are making and want to be able to do it too. I think, if they can do it so can I! Also cooking shows, like Masterchef and Top Chef, these shows make me wanna strive to make fancier elegant and more difficult dishes. Or try things that I never would have otherwise tried. And learn about techniques I otherwise would have never known about. What inspires me in the kitchen is “money”. Saving money that is. We love to eat out and experience new cuisines. I always catching myself saying “I wish I could recreate this at home”. So in the name of saving money, I am inspired to go home and try to recreate the dish. It has really helped to me develop my palate as well. I am a one hit wonder, I make it we love it/or not and move on. I would love to win, thanks! What inspires me in the kitchen is my family, I like to dress to impress with food – I love to her them telling me I’m a rockstar cook! I follow your Rss Feed through Google Reader. I keep my recipe books right on the counter. Lately it’s been the new “Power Foods” cookbook from Whole Living, and the vivid colors really inspire me to cook fresh! How lovely! These crepes look amazing! And I love this giveaway. My grandmother inspires me when I’m in the kitchen. I think back to all the amazing treats she crafted for us over the years. This plate of crepes is making my stomach growl. Thank you for sharing another delicious eat with me, my sweet friend. I hope you are having a happy afternoon. Much love! The crepes look great. I have never thought of crepes for dinner but will start to now. I am inspired by watching others in the kitchen. I love cooking show, cookbooks (have a small set of book shelves filled with), and have recently been enjoying your blog. Thank you for your time, dedication and inspiration of keeping an eye out for great foods. I’m inspired by all the cooking blogs I read. Also I love collecting cookbooks and magazines with cooking themes. Thanks for the giveaway! My best friend is a caterer….she provides plenty of inspiration! I am inspired by the farmers market and food blogs! My husband inspires me. He’s a fantastic cook, and really good at whipping up a meal sans recipe, just using what we have. My dad inspires me in the kitchen! He was a great cook when I was growing up and I’ve never seen him use a recipe; he just improvised with what we had and always made something amazing. Having my family and friends tell me what a great cook I am inspires me! It keeps me trying new things, I want to impress them everytime they come over! My children always inspire me in the kitchen. If they say they like it, I know it must be good! I’m inspired by using what I see in front of me. Substituting ingredients based on what I have in my fridge, freezer & cabinets is one of my favorite things to do! I am inspired by awesome food blogs like yours! Seriously! 90% of my new recipes come from food blogs. The Farmer’s Market inspires me! How fun! 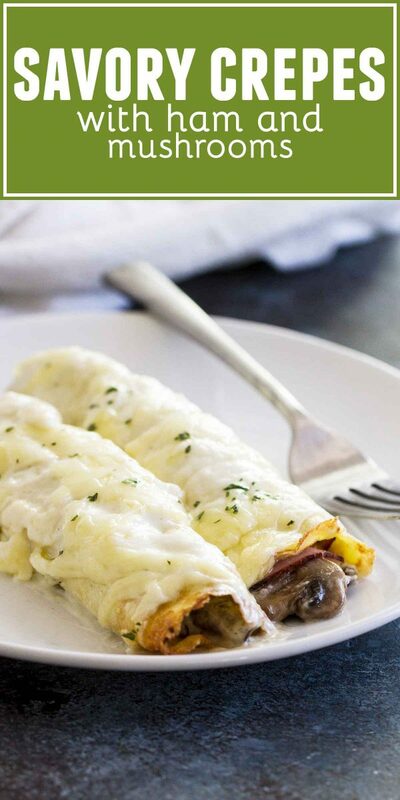 They’re like crepe enchiladas! Often, it is the ingredients that inspire me. If I go to the Farmer’s market, whatever is the freshest and loveliest will inspire me to create or find a great recipe for them. I’m inspired by all of the other amazing food bloggers, but especially the wonderful women in my family that are amazing cooks! These crepes look delicious! What inspires me in the kitchen….my family. I want to do my best and make them food they will LOVE. They make me want to do more and be better. That’s great Deborah that you feel that cooking and being creative in the kitchen is getting easier for you and you feel like it is your art! With so many cooking shows, magazines, books, websites, etc. out there now it does feel overwhelming sometimes. There have been plenty of times I thought I was being brilliant in the kitchen to only see the recipe I ‘invent’ somewhere else! Haha! But it only inspires me to keep trying different foods and flavor combinations! I’m inspired by other people’s food (which always tastes so much better than mine!) and blogs. I am inspired by the creativity of cooking! I just love to ‘play with my food’, create new dishes, try new foods, spices, seasonings, marinades… and GADGETS! I’m constantly upgrading and adding to my kitchen supplies! 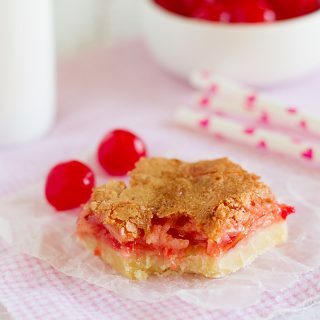 Cookbooks and blog recipes inspire me in the kitchen! Your stuffed crepes look delicious, Deborah! That little touch of nutmeg is perfect. For some reason, white sauces seem to need that. 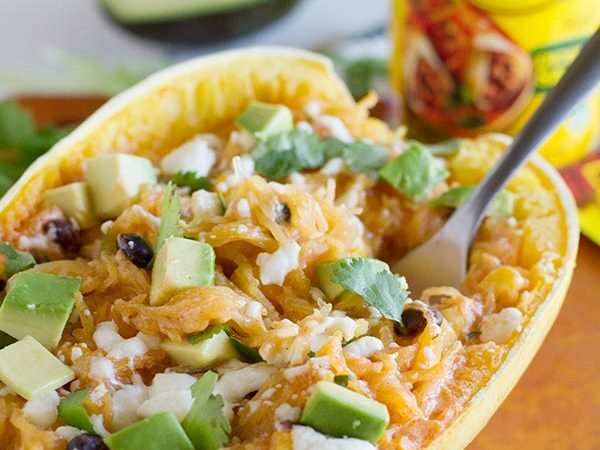 It’s great you’re getting inspiration to create your own recipes….this one is a winner! What a super giveaway! What I love to do in the kitchen is try recipes that 5 years ago I would never have attempted! Our soon-to-be-3 year old son has allergies and other feeding issues…..he inspires me! Cooking became a chore because I let these challenges confine me in the kitchen. I changed my mind set and now we are eating all kinds of yummy stuff I never would have put together without our new ‘rules’! I get inspired when I have to take a dish somewhere. That’s really when I hit up the blogs to find something super yummy! I get inspired by bright and interesting food. I would love to win these gifts for more inspiration! I’m usually inspired by my cravings! Whatever sounds good to me that day, I will somehow work it into a meal. I LOVE that cutting board! I get inspired by reading blogs. When I see a recipe that sounds really good to me, I have to make it. I love all the great ideas I get reading the food blogs! It motivates me to try something new and get out of the same ole rut. I get inspired by things that I’ve eaten somewhere else and also by reading food blogs…it’s inspiring to know that a person with a home kitchen (not a test one) has made a recipe. It gives me more confidence to try things out! random vegetables that come in my CSA box every week inspire me to try cooking new foods and experimenting with in-season produce! When I was growing up my Mom use to fill crepes with whatever leftovers we had in the fridge and then bake them with some type of sauce on top. Your stuffed crepes look delicious! And, that is one awesome pork prize pack. Someone is going to be very happy to win that! Hopefully it’s me. LOL! I’m a happy follower. What inspires me the most in the kitchen is my hungry family! But I also like to use the ingredients that I have in my pantry and fridge. I use those ingredients to inspire the dishes that I prepare daily. The first thing that really inspired me to learn to cook well was watching America’s Test Kitchen on television. Their scientific (and sometimes overly picky!!) methods really appealed to me and got me more enthusiastic and adventuresome in the kitchen. I also get a lot of inspiration from reading food blogs, like Taste and Tell! 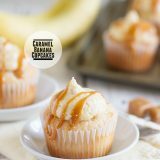 Recipes that have a picture to go with it! Food blogs are my biggest inspiration in the kitchen! I love cooking with fresh ingredients and local produce when ever available. I am inspired by trying to find foods that all 7 members of my family will eat. So many times only 3 or 4 like it. I love to try to make foods that everyone will love! There are many things that inspire me. Cooking for my large family, teaching my kids to cook, cooking shows on TV can inspire me. I think teaching my kids is what inspires me most. I also love finding and trying new ingredients. I am inspired by my husband. I love serving him something new, delicious and unique. I am inspired by my George Foreman grill. It’s the perfect way to keep the kitchen cool during the Texas summer. Wonderful ingredients are what inspire me in the kitchen. It gives me the ability to create a wonderful masterpiece. 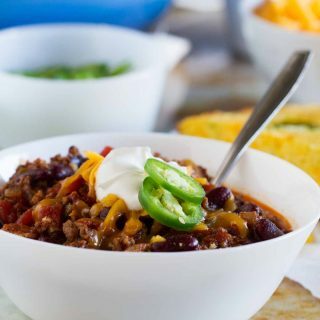 I love reading great recipes and comments from others who tried them out with their variations. Then I love to take those recipes and tweak them myself! Right now, the farmer’s market really inspires me. And my kids are always my inspiration when baking. Making something new and hoping my picky child will actually like it is what inspires me in the kitchen. Making sure my son has foods that are good for him but that still taste yummy. I am a HUGE fan of cooking shows and Gordon Ramsey inspires me SO much. lol. I love to cook different things. I am inspired by my 16 month old and husband. I love cooking for them! What inspires me in the kitchen is to give my boys good food. They are very adventurous and will try any type/style of cuisine so we experiment, watch food TV shows and read cookbooks looking for new things to try. I am definitely inspired by cravings and how I can work them into meals. I am inspired by the challenge of making something tasty for my family (usually just me and my husband to cook for at the moment). I love seeing the end result of my work and seeing how my husband (and others) enjoy it. Almost everything I read on the net inspires me, love cooking blogs, like yours! I am inspired by finding a new way to create something that tastes incredible….if it looks good that is even better! I am inspired by my children in the kitchen…sounds weird but it is true! They have such an amazing curiosity and they love learning about everything delicious, I enjoy teaching them. Right now my garden inspires me – I want to try to use what I’m growing in new and delicious ways. My husband inspires me in the kitchen. He is such a picky eater, I like the challenge of trying to make something new that he’ll love. I also love to try to make the dishes he does love healthier. My kids are what inspires me in the kitchen. They come up with so many food ideas, and I go in, trying to find a way to make them work (sometimes it’s impossible though)! Fresh seasonal ingredients inspire me in the kitchen! teaching my children a respect for our food and where it comes from inspires me in the kitchen! Yay!!! Thank you SO much for the awesome giveaway! I am inspired most by kitchen shows with new and different ingredients. I love making tasty meals for friends and family!! i am a baker, i love to make your meal complete. It inspires me by My Husband enjoying ,whatever I cook! what inspires me is my daughter she loves all the recipes that have been handed down from all the family members and we love to cook them together I love her face when they are done and not half bad looking. My picky kids inspire me to come up with new ideas in the kitchen.